Ampoint is the Center for Warehousing, Logistics & Industrial Space Leasing in Northwest Ohio. Ampoint Industrial Complex covers over 600 acres of prime real estate located 1/4 mile East of I-75 and 1.3 miles North of I-80/90. Take a look at our Location page to see how centrally and conveniently located Ampoint is. We are within 500 miles of over 40% of the United States population. Our Mission is: To exceed our customers' and our customers' customers expectations in service, cost control and creativity. Ampoint is a multi-faceted logistics and industrial space leasing company with over 2.5 million square feet which can accommodate a variety of users. Our service includes state-of-the-art technology and a dedication to exceeding the expectations of our customers. 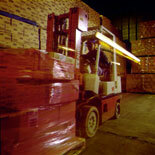 Check our Third-party Logistics Services page for more details. For information contact John Gunn at 419-666-3222 or email at jgunn@ampoint.com.